…by a longitudinal divider to 15 cm. Cats walked in a chamber that had a 250 cm long and 25 cm wide test corridor. An external wall of the corridor was made of a transparent plastic, which permitted visual monitoring and recording of the walking cat. During each recording session, a cat walked in both unobstructed corridor and in the same corridor obstructed with small objects. A single white wooden obstacle of 1 cm in height and 2.5 cm in diameter was the simplest obstruction. It was placed on sites whether the cat would normally step when walking in the unobstructed corridor. We determined that by letting the cat to walk 12-24 times along the unobstructed corridor at the beginning of the recording session while we took notice of where its right fore-paw stepped. Then we placed the object on one of these sites, and the cat continued to walk along now obstructed walkway. During other recording sessions, we placed many such objects on the floor, regardless of where the cats stepped normally, and let it make its way through them. 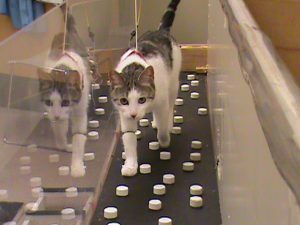 A computerized, active-marker three-dimensional real-time motion capture and analysis system Visualeyez (VZ-4000, Phoenix Technologies) was used to record the cat's movements while it passed through the test corridor. See Visualeyez page for more information.